Enrollment counselor Aaron Johnson headed back to Joplin, Missouri for the holidays and was pleasantly surprised with the changes and cleanup he found. Joplin was devastated by a tornado on May 22, and Johnson hadn’t seen his home town since June, when he and a team from GCU drove a van full of clothing and supplies donated by faculty and staff to families affected by the disaster. The destruction he saw then was sobering. According to Johnson, the Walgreens, Wal-Mart and Home Depot that were all damaged in the tornado have already been rebuilt and are open for business. Several other smaller businesses, as well as many homes, are making progress, too. “Although you can still see from one side of town to the other where the tornado went through, it is nice to see that path clean and not cluttered with the remains of everything the tornado ripped through,” says Johnson. Reminders of the tornado are everywhere, though. 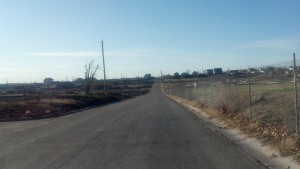 St. John’s Hospital and Joplin High School, both of which took direct hits from the tornado, still sit as empty shells. Students have turned the local mall into a temporary school. 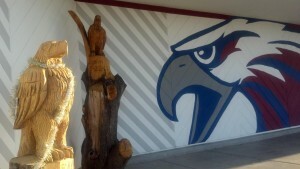 But they brought a piece of school spirit with them – part of an old campus tree that an artist carved into an eagle, the school’s mascot. 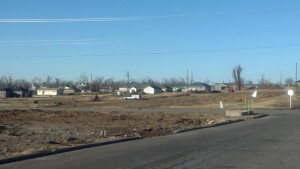 Word of how the GCU community helped the town has spread through Joplin, according to Johnson. Residents he didn’t even know came up to him and thanked him for the efforts. “All I had to do is mention GCU and they knew exactly what we did and how we came so far to help,” says Johnson. While there are some who have moved away and don’t plan to return, most have stayed to rebuild and ensure that Joplin comes back stronger than ever. 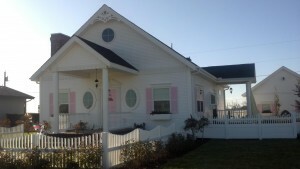 Joplin will be featured on ABC’s “Extreme Makeover: Home Edition.” The crew helped rebuild several houses in town and will air a two-hour special on the efforts on January 13, which is the show’s 100th episode and the series finale. Check local listings for show times.